April | 2013 | Crystal Water Villas Blog - Lake of the Ozarks! Bring your poker face this weekend! The 16th Annual Spring Harbor Hop is happening this Saturday, May 4th at the Lake of the Ozarks. This is the perfect time of year to catch see the blooming Dogwood trees, so be sure to bring your camera! If you’re more interested in poker, players can donate $15 for each seven-card hand. There’s no better way to kick off the boating season. The Harbor Hop is a poker hop in which participants pick up playing cards in order to build a winning poker hand and become eligible to win prizes. Players can donate $15 per seven-card hand and start their run to draw their first card at any of the sponsoring restaurants, and marinas along the lake’s main channel and the Big Niangua and Gravois arms. The Spring Harbor Hop traditionally is held the first weekend of May to kick off our boating season. The Lake of the Ozarks CVB sponsors the Fall Harbor Hop as well as the Spring Harbor Hop held the second weekend in October to extend the fall boating season. Other sponsors include the Lake of the Ozarks Marine Dealers Association and Waterfront Restaurants. For more information and a list of venues, go to www.funlake.com. The weather is warming up and it’s FINALLY time to kick off the summer! 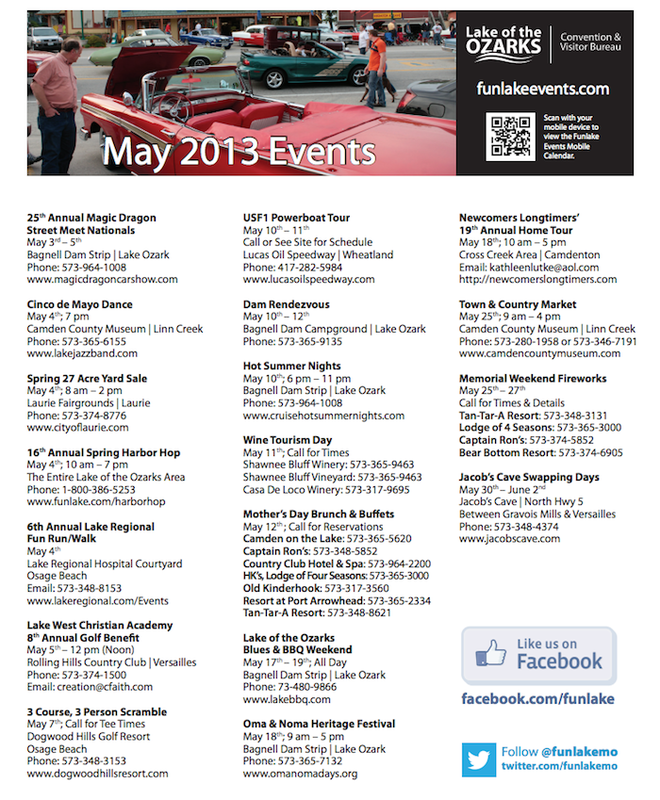 Check out this great listing of events from FunLake.com. Also, be sure to download your own copy to bring with you when you come down to the lake. Don’t Miss Out: Coupons in Camdenton! Everyone loves a good deal, right?! If you’re coming to the Lake of the Ozarks this summer, be sure to check out Lake News Online’s Radar Frog. They have several coupons to save money at local restaurants and other attractions in Osage Beach, Camdenton, and Sunrise Beach. A few of them include Imo’s Pizza and Big Bear Resort. Don’t forget to check out our Local Area Guide for restaurants, attractions, spas, and more. Remember: We are here to answer any of your questions about the lake! Extended Off-Season Rates Just For You! Master bedroom at Hillcrest — Has a Private Balcony and a Relaxing View of the Lake. We’re extending our off-season rates to until just before Memorial Day weekend! That means if you’re eager to squeeze in a vacation, you have a month to take advantage of this savings. As an example, Hillcrest is $180 per night in the off-season and can range from $334 – $360 per night between the end of May until early September. Our off-season rates usually end on April 30th, but we’re extending them until May 23rd. Take a look at our cozy properties and let us know if you have any questions! A powerboat race is returning to the Lake of the Ozarks in June after a taking a hiatus for several years due in part to the economy. The Missouri Highway Patrol will have a public information meeting later this month about the upcoming Lake Race 2013 powerboat race on the Lake of the Ozarks. The race, part of the Offshore Super Series, will take place on Lake of the Ozarks between Bagnell Dam and about the 3.5 mile mark of the main channel. For a listing of race week events, see the Lake Race’s website. Don’t forget to plan ahead and book your stay with us! The Offshore Supers Series will be held Thursday, June 6th – Sunday, June 9th. Some prefer to get away from all things technology when they go on vacation. For other, it can be a little tough to unplug completely. If you’re the latter type of person, here is a list of some of our properties that have WiFi Internet! And unlike many hotels, there’s no extra charge for Internet. The big plus of having Internet — You can take photos on your digital camera or smart phone and easily upload them to Facebook or send them by e-mail to friends or family at the end of the day. There’s nothing better than sharing those special moments with the ones you love! Blue Gill – This charming neat as a pin cabin resides on an open cove (1-mile marker of the Gravois Arm) and is sure to be a favorite retreat for many of our family vacationers. Jewell – Lakeside Porch and Swing. Shady Grassy Yard. Private Dock. Hammock. Lots of Parking Space. Carriage House – Panaramic Bluff Property with Main Channel Water Views. Huge Cantilevered Bluff Deck. Award Winning Manicured Gardens. Community Property – Guest House to Eagles Nest. Jim’s Hideaway – Private one level lake front cabin on a level lot with easy water access. Perfect for small families with young children. Clearwater Bay Condo – Wonderful Condo Complex with an Unobstructed View of the Lake. Great for Couples or Small Families and Close Attraction Access. Eagles Nest – This masterpiece “couples home” awaits you! 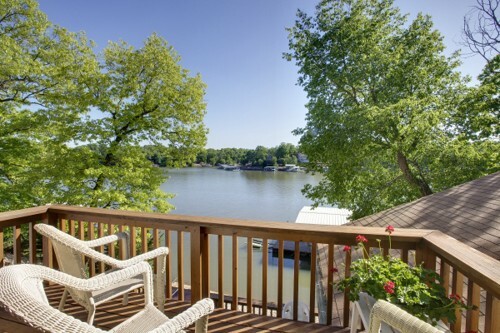 This pristine property sits on a picturesque bluff that over looks the Lake’s main channel of the Osage Arm. Casablanca – Cozy Wood Tone Knotty Pine Home, Separate Lower Level for the Kids! Community Property and Ideal For Family Reunions! Charlie’s Lake House – Great Family Home with Reasonable Rental Rates! Wonderful Shaded Deck and Martini Deck. To find the rest of the homes with Internet, simply click on “Internet Access” when you’re searching for a place to stay! And as always, don’t hesitate to give us a ring at 1-866-273-2169, reach out to us on Facebook, or leave a comment here!